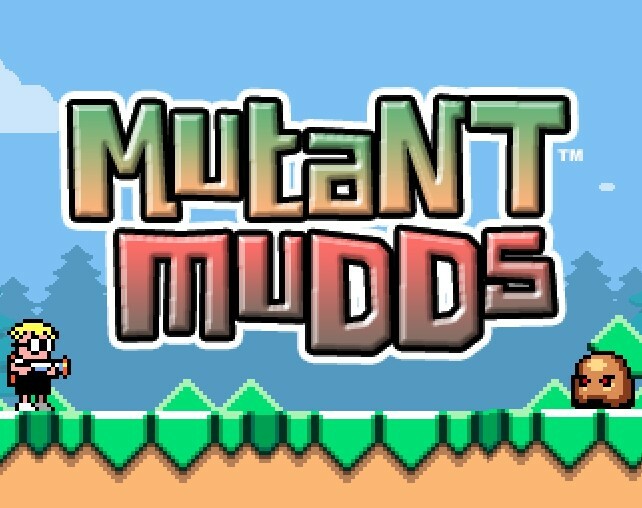 Mutant Mudds brings us back to the old-school retro style look, and it's a game that should be played by all seasoned players! 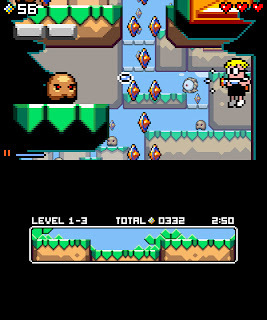 This one was supposed to be released as a retail title on Nintendo DS as Maximilian and the Rise of the Mutant Mudds, but sadly, that didn't happen. The project was then moved to Nintendo's DSiWare service, but ended up not going there either. The game eventually found a home on the Nintendo eShop and PC, under its current name today. It's been a long time coming, but it has been worth the wait! This game is developed by Renegade Kid, the team that worked on popular games such as Dementium and Moon for the Nintendo DS, and is lead by Jools Watsham. 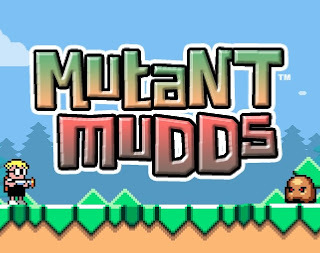 Mutant Mudds is an old-school platformer, where your objective is to eliminate the invasion of Mutant Mudds that have landed on Earth! The player controls Max. Max is equipped with a jet pack, allowing him to hover across areas he can't do by just jumping alone (which is very similar to Gargoyle's Quest on the Game Boy). Also equipped is a water cannon to help eliminate enemies. There are 40 levels spanning across 5 worlds in the game, which includes main, secret and boss levels. Each main level has 100 jewels, and a water sprite in all levels to collect. 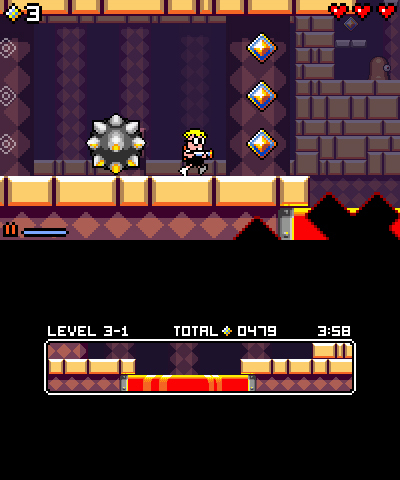 Mutant Mudds difficulty is harder than first expected. The level design is done extremely well, and the environment of the enemy's moves takes a while to get used to. There are warp panels that allows Max to further away or closer towards you, which may alert some players like myself of where you are and where you're actually going (believe me, I got tricked at a couple points near the end of a level because I thought I was touching the water sprite, but really wasn't!). Also, each level has to be done on a time limit, which may put some pressure on players to get everything in that level. Each level has a secret area, which is marked either G-Land or V-Land. These secret level doors actually has an influence to the Game Boy and Virtual Boy. Fortunately, when you enter these secret doors, the time resets. If you die in these secret areas you immediately go right back to the beginning of it without having to start at the beginning of the main level itself. In terms of collecting things, you only need to collect the water sprite itself. However, that doesn't mean you will go without a challenge, as the secret areas may be harder than the main areas, bringing veteran players to the test. Mutant Mudds has great usage of the 3D feature, with at least three layers put into it. The 3D fits quite well with the colourful, retro layout. Another thing that gave me quite the appreciation is the chiptune music, which is an added bonus! Going to the game over screen a lot of times usually is frustrating, however with this one, the music really touches my heart and is one of the most memorable tunes I've heard in a long time! If there is any complaints about Mutant Mudds I have, it's the lack of items and objects. There is only three available right now, which is not much. If it had a variety of weapons and/or objects of such like in the Mega Man games, then players would have the ability to pick the weapon of their choice. 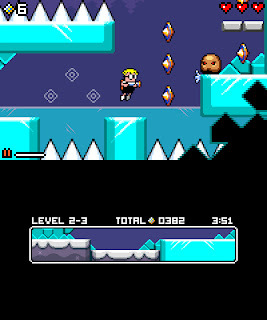 Renegade Kid has made Mutant Mudds is a game that can't be missed. It's clever level design and its difficulty makes this a must download purchase. Although, the initial game is fairly short, there will be extra levels added soon. If you're a fan of these types of games, or someone who is looking for something new to play, go download this now and experience this terrific retro-style platformer!